The Alchemist is a venue that aims to be different. With surreal and eyecatching art on the walls, and floor to ceiling windows illuminating the dramatic drinks, the venue needed a bar to act as the perfect stage for its theatrical offerings. Cocktails are far and away The Alchemist’s most popular drinks, with expert mixologists on hand to create a variety of weird and wonderful beverages. The primary focus of our operational design was to increase speed without ruining the theatre of the drinking experience. We worked closely with staff at The Alchemist to plan the exact back bar layout. The bar has a very complex cocktail menu, so every piece of equipment is located for speedy and impressive cocktail creation. Our work at The Alchemist was a full bar fit out, from back of house to front, including the bar, cellar, ice room, glass washers, kitchen, cooking suite and bespoke extraction system. 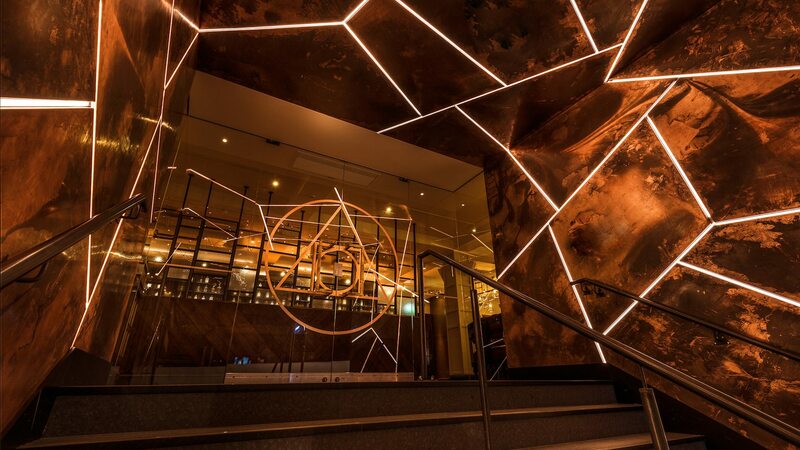 While The Alchemist is a 70% wet-led bar, customers can order food. We created a cooking suite so customers can see the chefs at work, again tapping into the venue’s theatrical ambience. Mixologists at The Alchemist use Bunsen burners and other equipment to make some of their cocktails. We carried out risk assessments to ensure the bar was safe for staff and customers alike.